Sunndal has a wild and beautiful scenery with alpine mountains, fjords and several valley bottoms where Sunndalen is the main valley. 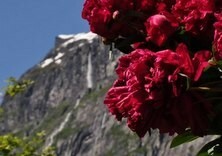 At the beginning of the Sunndals fjord five peaks rises up to 1700 meters above sea level. One of these is Stor-Kalkjinn, which is northern Europe's highest mountain rising straight up from sea level, with its 1886 mamsl. The table below shows samples from Sunndal - wild and beautiful! A unique natural phenomenon in Norway. Steep mountain cliff, moraine ridges and terraces create a fan-shaped river system where five rivers meet. Three rivers form magnificent waterfalls down in Åmotan. 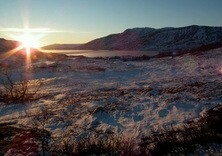 Aursjøvegen road - from the fjords to the rugged mountains. Aursjøvegen is a road to mountains and wild valleys, heady waterfalls, potholes, the power history, marked hiking trails and the great outdoors. Dovre-Sunndalsfjella National Park is a Norwegian national park located in a high mountain area of ​​Dovre and Sunndalsfjella, where Sør-Trøndelag, Møre og Romsdal and Oppland counties meet. The park was created in 2002 to preserve an intact alpine ecosystem, and it covers an area of ​​1.693 km ².
Innerdalen has frequently been called the most beautiful mountain valley in Norway. Drive the RV 70 road between Sunndalsøra and Tingvoll, turn off at Ålvundeid and follow to Nedal. 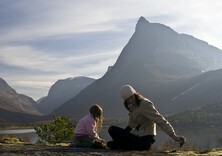 Park your car and enjoy a stroll for an hour the 4 kilometers to the heart of Innerdalen. Trollheimen is a mountain range on the border between Nordmøre in Møre og Romsdal and Sør-Trøndelag. In the west, the mountains is of alpine character, while in the east the landscape is quieter. The area is bordered by Surnadal and Rindal in the north, Orkdal and Dovre Railway in the east, Sunndal in the south and fjords in the west. Vinnufossen has its outspring from Vinnubreen glacier, which is Møre and Romsdals largest glacier, and cascades down the mountainside with a 860 meters drop in several steps. Vinnufossen can be experienced from a laybay on highway 70, just a few kilometers from Sunndalsøra towards Oppdal. By far the nicest view you get if you keep walking the path a few hundred meters further up the valley.